Cheesy Chongo's Cheap Chat: TED GOT THE COVER! So it looks like we have a model on our hands...it's not either of the kids. 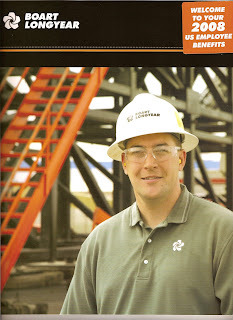 Boart Longyear came out with the new and improved employee benefits manual for 2008 and Ted is on the cover. This will be circulated throughout the entire company with in the United States! Ted has been going around the office signing everyone's manual. He is taking the fame all in stride and he is still a down to earth guy. Fame hasn't changed him all that much. If you would like to request a signed manual he will do so at a small fee. Congratulations on the modeling contract! That's dang cool, but forget the model, I want one of those hard hats and a pair of those safty glasses.